The ever-changing landscape of modern retail therapy is explained. But 8,000 miles away, another vision of the mall has taken hold – one that could well spell its future. Hong Kong has more than 300 shopping centers, but most of the city’s malls don’t sit on asphalt parking lots; rather, they’re above subway stations or underneath skyscrapers. In my book “Mall City: Hong Kong’s Dreamworlds of Consumption,” I describe how some are connected to so many towers that they form megastructures – cities in and of themselves that can accommodate tens of thousands of people who live, work and play without ever going outside. Hong Kong also has the world’s tallest vertical malls – “mall skyscrapers” that rise up to 26 levels, with crisscrossing “expresators” that shoot shoppers high up into soaring atriums. Now developers in mainland China and around the world are beginning to closely copy Hong Kong’s projects. But will they improve upon the suburban shopping mall’s faults – or simply exacerbate them? In Hong Kong, these urban malls took off after 1975, when the local government created the Mass Transit Railway Corporation (MTRC). In addition to building metro lines, the MTRC developed land. (In most cities, transit corporations are separate entities from developers.) The unique arrangement allowed the city to seamlessly integrate subway stops with office and shopping complexes. Hong Kong’s urban mega malls quickly became the most visited malls in the world. Unlike their counterparts in suburban American, Hong Kong’s urban malls lie closer to the original intentions of mall visionary Victor Gruen. 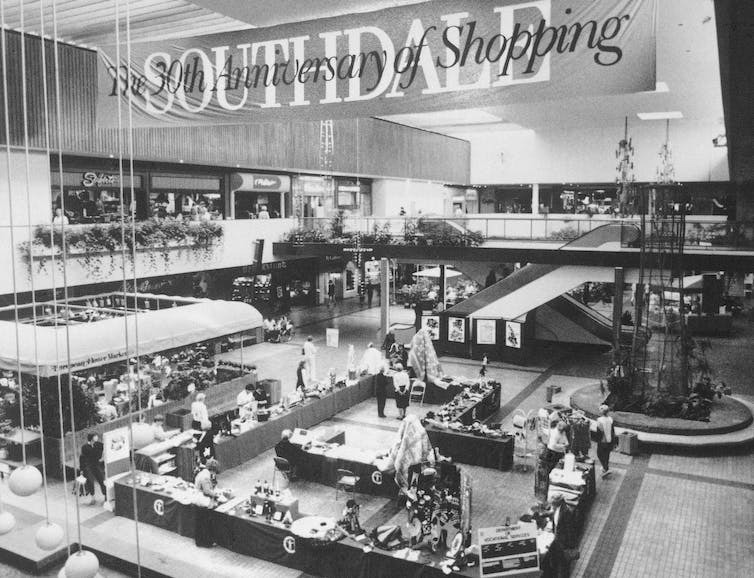 In 1956, Gruen designed the first mall, Minnesota’s Southdale Center, with many of the features we associate with malls today: It was fully enclosed and climate controlled, with anchor stores, escalators and a glass-roofed atrium. But the Southdale Center didn’t exactly fulfill his vision. The Austrian immigrant, who had changed his name from Grünbaum to Gruen (German for “green”), wanted malls to be more than a shopping center. He saw the mall as a new town center – a hub of apartments, offices, a park and schools that would offer a lively alternative to America’s lackluster, bland, suburban sprawl. The Southdale Center pictured in 1986, 30 years after its opening. His dream was never realized: American malls remained insular, and, like Frankenstein’s monster, only nourished the frantic consumerism Gruen was trying to mitigate. Gruen eventually returned to Vienna in 1967 – only to find a shopping mall just south of the old town. But what would Victor Gruen think of Hong Kong’s urban malls? They belong to a high-density, mixed-use community, and they’re surrounded by apartments and pedestrians, rather than a sea of asphalt and cars. In other ways, they exceed Gruen’s vision: They’re integrated into mass transit and have stunningly tall vertical atria. 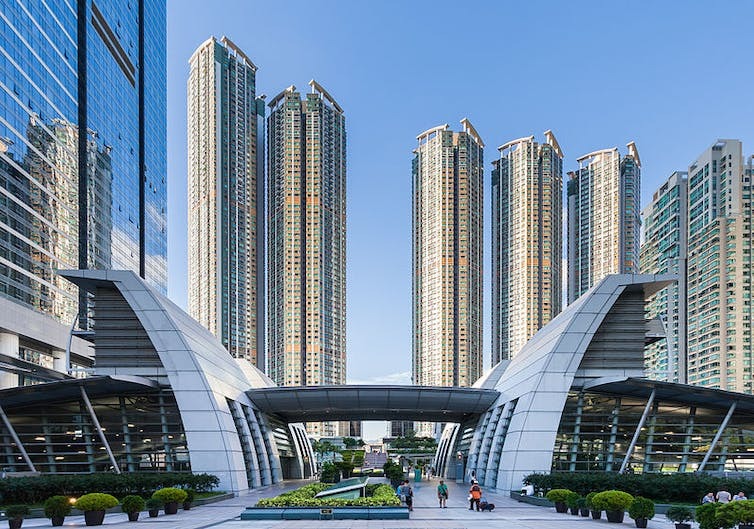 For instance, Hong Kong’s Union Square is a megastructure above a train station and includes residences, offices and hotels, all built on a podium mall. The whole thing houses approximately 70,000 residents on 35 acres, an area the size of the Pentagon. The monolith represents an entirely new concept of urban living, a self-sufficient “city within a city” – but one without streets, blocks or individual buildings. Hong Kong’s Union Square development. As convenient this urban form may be, it does come with strings attached. In the case of Union Square – as in many other podium-tower developments – the mall is deliberately placed at the intersection of all pedestrian flows, between all entry points into the structure and the residential, office and transit areas. They’re impossible to miss and impossible to avoid. For millions of residents and pedestrians, then, entering commercialized areas becomes an inevitability, not a choice. It normalizes a culture of consumerism: Everyday life is played out on the terrain of the mall, and the private shopping atrium takes on the role of the public square. Because Hong Kong’s apartments are small – its summer climate hot and humid – the mall becomes a default gathering place. And why not? There’s plenty of space and the air-conditioning is free. And while you’re there, you might as well browse around the shops and spend some cash. In this respect, Hong Kong’s mall cities achieve the maximum potential of something scholars call the “Gruen Transfer.” This tongue-in-cheek term, coined in “honor” of architect Victor Gruen, refers to the moment when the mall’s undulating corridors lead them to simply shop for shopping’s sake, rather than approaching shopping with a plan to buy a specific product. The mall’s inventor – who lamented the closing of small individual stores in cities because of “gigantic shopping machines” in suburbs – would have surely turned in his grave had he known this machine had become the city. Will Hong Kong’s malls go global? Today the fate of Gruen’s invention will take another turn. Hong Kong’s urban mall developments have become the envy of other cities – including Shenzhen and Shanghai – that are looking for ways to build compact, transit-oriented, lucrative developments. 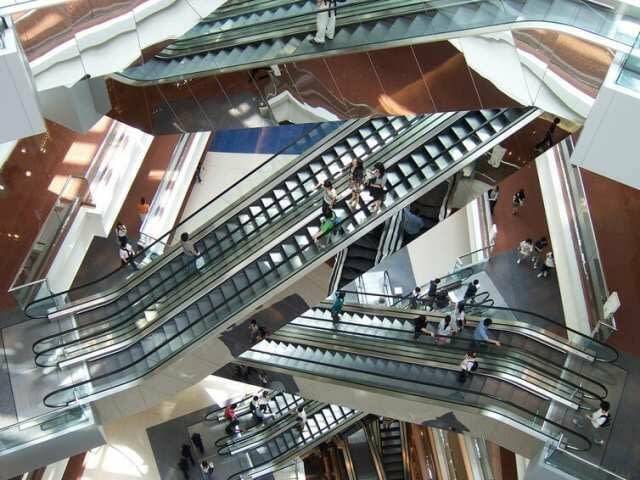 The Asian hyper-dense urban mall is also making an appearance in American cities. Miami has Brickell City Centre, a five-story mall in the heart of the city. Covering three city blocks, it’s topped by three high-rises (and was built by a Hong Kong developer). New York City is building a seven-story mall attached to two skyscrapers in Hudson Yards, America’s largest private development. The Santiago Calatrava-designed Oculus – the centerpiece of the World Trade Center – has a mall with over 100 stores, with its white-ribbed atrium attracting an army of tourists taking pictures with selfie-sticks. Since the hub connects office buildings with train and subway stations, the stores are also “irrigated” by the 50,000 commuters who pass by each weekday. In short, the mall isn’t “dead” – it’s just changing. The development model is so popular in China – a symptom of the country’s rapid rise of domestic consumerism – that developers even coined a term for it: “HOPSCA,” an abbreviation of Hotel, Offices, Parking, Shopping, Convention center and Apartments. Celebrate International Women’s Day 2017!